Torrential rains from today, Sunday 2/18/18, through Thursday 2/22/18 is expected to flood many states from Cleveland Ohio to Houston Texas. 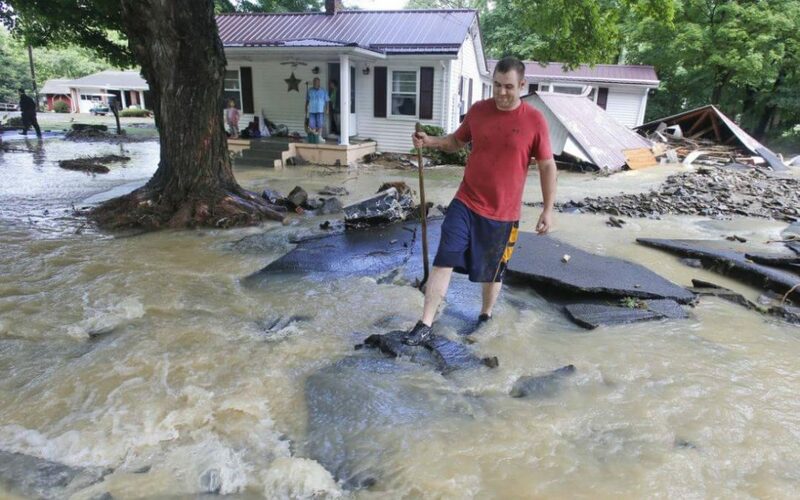 AP PHOTO – Steve Helber: Mark Bowes, of White Sulphur Springs West VA., makes his way to the road as he cleans up from severe flooding. A deluge of 9 inches of rain on parts of West Virginia destroyed or damaged more than 100 homes and knocked out power to tens of thousands of homes and businesses so far. See the full story below from Accuweather. Relentless rounds of rain from the lower Red and Mississippi river valleys to the central Appalachians will elevate the risk of both small stream and river flooding into the end of February. The risk of flooding has not ended with the rain from Feb. 15-16. Additional storms will ride northeastward from the western Gulf of Mexico and the southern Plains on a path for the northeastern United States for the rest of the month. “Some locations have already received, or will receive, more than a month’s worth of rain from a single storm,” according to AccuWeather Chief Meteorologist Elliot Abrams. From a cumulative aspect, there is the potential for 5-10 inches of additional rain to fall on some communities from the middle to the end of February. “Since the ground is already saturated in some locations and will have little time to dry out between storms, each dose of drenching rain will renew the risk of urban, small stream and river flooding,” Abrams said. Following the rain event from this past Thursday alone, the upper Ohio River remains at moderate flood stage. The Tennessee River at Savannah, Tennessee, is projected to remain at moderate flood stage through most of the upcoming week based on rain that has already occurred. For some of the larger rivers, such as the Ohio, the period where levels may remain above flood stage may continue through the end of the winter and into the spring. Elsewhere, across the Northern states, snowfall that melts may add to the flood risk. The threat may expand to new territories that have not yet had the risk of flooding this year, including portions of Texas, Arkansas and Oklahoma. Low-lying areas as far south as central Texas, as far north as the central Great Lakes and as far east as the mid-Atlantic and southern New England may dabble with high water at some point over the next couple of weeks. The first heavy rain event on the horizon is expected to unfold from eastern Texas and Louisiana to the Great Lakes during the first half of the new week. Small streams that run through hilly or urban areas will be at greatest risk for rapid flooding. Meanwhile, low-lying, unprotected areas along the major rivers are likely to experience a few rounds of high water. People living in these areas should closely monitor the situation, take precautions and be prepared to move to higher ground if necessary. Motorists who journey along low-lying areas of streams and rivers should be prepared to take an alternate route. At the very least, the wet weather pattern will lead to slow travel. Motorists should expect poor visibility, excess water on the roads and heavy rain hitting the windshield. Allow extra time to get to your destination. Never drive through flooded roadways. The water may be deep enough to stall and sweep a vehicle away. The road beneath the surface may have been washed away. The fog and low cloud ceiling that often accompanies the rain is likely to lead to airline delays. The repeating rainfall will also raise the risk of mudslides and other debris flows in hilly areas and through cutouts in the mountains of major highways. Meanwhile, in the Southeastern states, the bulk of the rain will be screened out by the southern Appalachians and blocked by a large area of warm and dry aircentered off the Florida coast. However, occasional showers and thunderstorms may survive the eastward trip over the next couple of weeks.